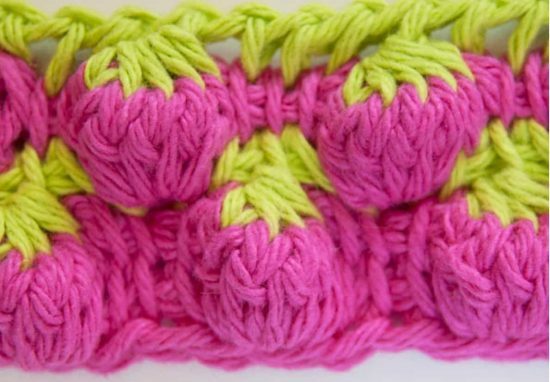 You will love to try this super popular Strawberry Crochet Stitch! It’s perfect for cushion and blanket projects and we have a video tutorial to show you how. Watch now. 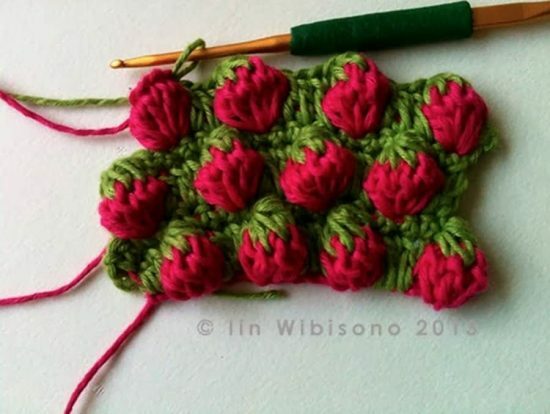 Have you discovered the super cute ‘Strawberry Crochet Stitch Pattern’ before? What a unique appearance and texture it has. 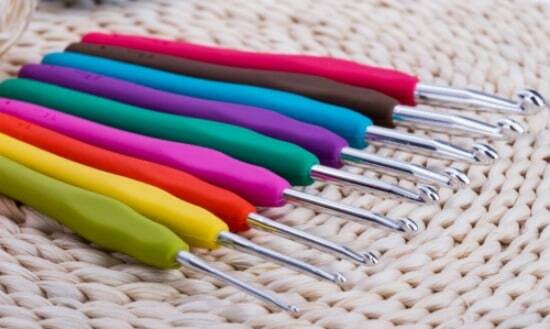 It’s very similar to the popular Bobble Crochet Stitch and it will be perfect for all sorts of projects. You can make blankets and cushions, and it looks quite delicious in Pink yarn too. 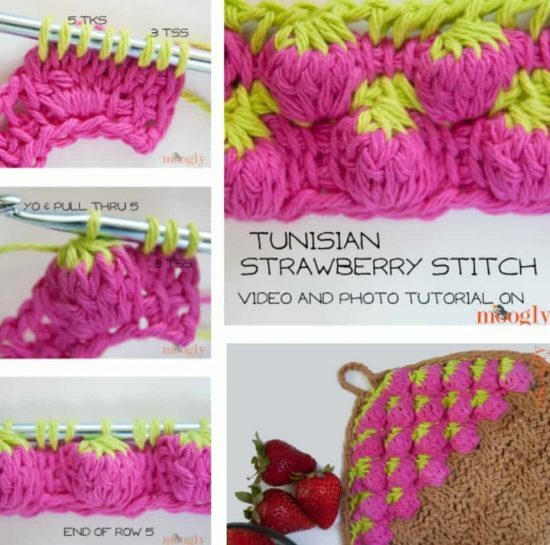 It is also known as the Tunisian Strawberry Crochet Stitch. The good news is it’s easy once you know how. 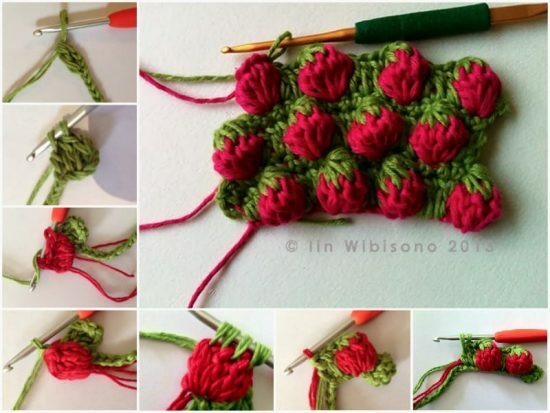 We have included a video tutorial in our post that will assist you to learn this crochet stitch to perfection. Be sure that you take a few minutes to view. You will find the details and video further down our page. Scroll our post to the end and don’t miss a single idea. Note: Traditional tapestry crochet technique is used in this pattern. 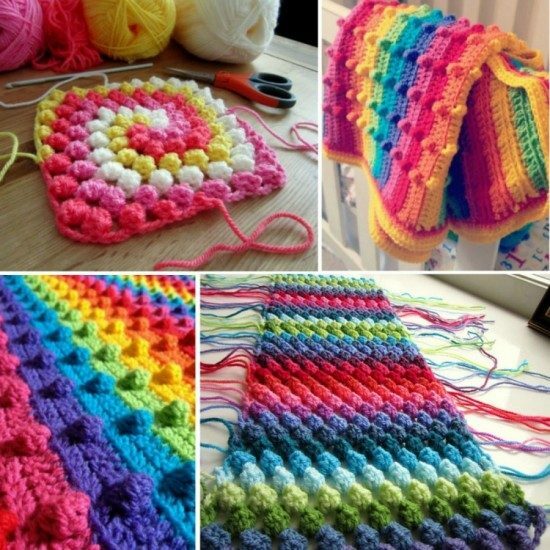 Crochet the next several stitches as usual, with colors not in use laid flat inside your stitches. You should not be able to see these colors in your work at this point. This is known as carrying the unused color to achieve a neat final piece. Weave in loose ends as work progresses. Use mermaid tears stitches for edging in treble crochet. Continue scrolling for Video. You are going to love this gorgeous collection of popular Crochet Animal Slippers and we have them in adult and baby bootie size. There is something for everyone and knitters will love the Rubber Duck version too. Check them all out now and Pin your favorites. Everyone's loving these crochet superhero blanket pattern ideas and you will too. We have all your favorites and you'll be spoilt for choice. You are going to love this adorable Crochet Jellyfish Pattern. 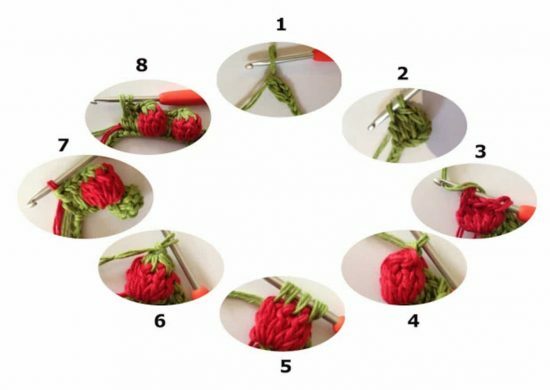 See how to turn it into a mobile and a keyring and watch the easy to follow video tutorial. We have lots of free patterns and gorgeous ideas you'll love.